The Dodge Durango’s combination of uncompromised utility, advanced technology, class-leading towing and driving range, confident driving dynamics and aggressive styling make it the Dodge Charger of the SUV segment. For the 2016 model year, the Durango lineup features new exterior appearance packages, new upgrades to its class-exclusive Uconnect system, a new standard wheel on each model and four all-new paint colors. For 2016, all Dodge Durango models now offer Sport mode capability, which drivers can select for a more responsive driving experience. Turning on Sport mode changes the steering calibration, pedal calibration and shift pattern to further enhance the Durango’s outstanding on-road driving performance. Engine stop-start (ESS) technology, an emission-lowering and fuel-saving feature, is now standard on 2016 Dodge Durango models powered by the 3.6-liter Pentastar V-6 engine. ESS technology increases fuel efficiency by shutting the engine off when the vehicle comes to a complete stop. Amenities (radio, gauges, heating or air conditioning, etc.) continue to operate, making the operation transparent to the driver. The engine restarts automatically when the driver releases the brake, allowing seamless acceleration. Starter and battery systems have been upgraded to complement the ESS technology for heavy-duty operation on models equipped with the feature. This includes a high-durability starter housed in a stronger case, heavy-duty flywheel teeth and a more robust starter solenoid. During testing, the new starter was subjected to durability testing cycles more than 2.5 times that of a non-stop-start equipped unit – more than 300,000 on/off cycles. The new battery features 700 amps with absorbed glass mat (AGM) technology. System voltage is continually monitored through a battery sensor. If the battery’s charge is reduced, the vehicle will discontinue stop-start until the battery is recharged to an acceptable level. Stop-start is activated automatically and requires no input from the driver. A system disable switch is located on the dash if the operator wishes to suspend the feature. Also new for 2016, the Dodge Durango Citadel now features as standard a newly designed 20-inch fully polished wheel and a monochromatic exterior appearance with body-color front fascia, rear fascia and wheel flares. The Anodized Platinum Appearance Package is available on the Citadel and features 20-inch Satin Carbon wheels with platinum exterior mirror caps, grille surround, fog lamp bezels, exterior badging, door handles and lower sills. The 2016 Dodge Durango R/T includes a new standard 20-inch low gloss Granite Crystal wheel and a plethora of features added as standard, including front ventilated Nappa leather seats with either Black or Radar Red Nappa leather; perforated, heated steering wheel; power tilt/telescoping steering wheel; power eight-way passenger seats; rain-sensitive windshield wipers; 8.4-inch premium touchscreen radio with navigation; cargo net and cargo compartment cover; and SmartBeam HID headlamps. 2016 Dodge Durango The Brass Monkey Appearance Package is new for 2016 and available on the Limited model to further differentiate the Dodge Durango on the road. The Brass Monkey Appearance Package features 20-inch Brass Monkey (Burnished Bronze) wheels, Gloss Black grille and exterior badge, and body-color door handles, exterior mirrors, front fascia, rear fascia, sills and wheel flares. The Limited model also features a new finish on the standard 18-inch wheel that is polished with Granite Crystal pockets. The available Premium Group has been enhanced with new 20-inch polished aluminum wheels and body-color lower front fascia, rear fascia, sills and wheel flares. New for 2016 on the Dodge Durango SXT is a standard Satin Carbon finish on the 18-inch wheel. For 2016 Dodge Durango vehicles equipped with the 8.4-inch touchscreen, Uconnect is introducing new features that include the all-new Drag and Drop menu bar, Siri Eyes Free, Do Not Disturb, and SiriusXM Tune Start . Drag and Drop Menu Bar: Durango owners now have the ability to personalize their touchscreen controls to fit their lifestyle and have one-button access to the features and services they value most. From Travel Link to heated or cooled seats and Yelp, drivers now can simply drag their favorite feature or service icon from the apps menu and move them to their Uconnect system’s main menu bar. Siri Eyes Free: Via the voice button on the steering wheel and compatible with an Apple iPhone 4s or later, with Siri Eyes Free, drivers can speak natural language voice commands to send text messages, play music, set reminders, place phone calls and access turn-by-turn directions. Drivers will simply push and hold the voice recognition button on the steering wheel until the Siri screen appears on the 8.4-inch touchscreen and hear the audible tones. Do Not Disturb: Vehicle owners who prefer not be interrupted with phone calls or text messages while driving can choose to turn on the new “Do Not Disturb” and “Reply with Text Message” feature. Located within the Uconnect system’s phone screen, once enabled with the push of a button or via voice command, the Do Not Disturb icon will route all incoming mobile calls to voicemail and suppress text messages. If the vehicle owner chooses to enable the Do Not Disturb feature, they also have the ability to send a default or customized response once a call or text message is received. SiriusXM Tune Start: A SiriusXM feature new to FCA US customers that starts songs from the beginning when switching between their favorite pre-set satellite radio channels, ensuring that drivers and passengers do not miss a beat of their songs they want to hear. The 2016 Dodge Durango is available in four trim levels: SXT, Limited, R/T and Citadel. Exterior colors include Red Pearl, Light Brownstone, Luxury Brown, Ivory Pearl Tri-coat, Billet Silver Metallic, Bright White, Brilliant Black Crystal Pearl, Granite Crystal Metallic, Maximum Steel Metallic, Redline 2 Coat Pearl (Rallye, Blacktop and R/T only) and True Blue Metallic. Dodge Durango offers a host of premium features, such as high-end interiors, the latest infotainment technology and impressive powertrain options, along with the exterior design that is distinctively Dodge. The Dodge design team went to work to create an exterior that conveys how advanced the Durango is, while maintaining the muscular body and confident personality customers expect from Dodge. The 2016 Dodge Durango features projector beam headlamps, with LED daytime running lamps on SXT Rallye and Blacktop packages, Limited, R/T and Citadel. The LED lamps run horizontally along the bottom edge of the headlamp and form a unique “hockey-stick” shape. Bi-xenon high-intensity discharge (HID) headlamps are standard on R/T and Citadel. Auto-leveling technology adjusts headlight beam aim for slight changes in elevation. Standard on SXT are bright headlamps, bright chrome grille, and bright chrome accents on the front and rear fascias and side sills. dark-tinted headlamp bezels, body-color front and rear lower fascias, wheel flares, grille and sill moldings, all unique to these packages. The Blacktop Package adds these same design elements, but with its own unique Gloss Black crosshair grille and gloss black 20-inch aluminum wheels. The Dodge Durango has 18- and 20-inch aluminum wheel designs for every trim level, and feature finishes ranging from silver painted to polished aluminum to class-exclusive Hyper Black and Gloss Black. In total, there are nine wheel designs and finishes to select from. The rear of the Durango sees the dramatic LED racetrack tail lamp design inspired by the Dodge Charger and Dart. This latest evolution of the racetrack design features technology that blends the individual LEDs into one seamless looking ribbon of light. Large 3.5-inch dual exhaust tips are standard on V-8-equipped vehicles, as well as the V-6 powered Citadel, Rallye models and Blacktop Package; other V-6 powered Durango models have a 3-inch single tip. The 2016 Durango continues to deliver excitement and refinement with world-class suspension and performance. Benchmarked against premium performance SUV’s in the market, Durango delivers modernized refinement with electronics, suspension and structural characteristics, which are usually found at much higher price points. The short/long arm front suspension and isolated multi-link rear suspension features isolated front and rear cradles to deliver precise on-road handling and comfort. The four-wheel independent suspension, combined with the Durango’s nearly 50/50 weight distribution, transmits to a solid driving feel and fun-to-drive characteristics. The Dodge Durango’s rear-wheel-drive-based drivetrain is the foundation for its outstanding on-road driving performance. Available all-wheel drive (AWD) further enhances driver confidence by leveraging the SUV’s 50/50 weight distribution. The Durango’s two AWD systems – one for the V-8 and one for Pentastar V-6 powered models – greatly enhance the vehicle’s traction and handling by delivering a smooth driving experience on a wide range of road conditions. all-wheel drive Durango features a low-range transfer case with a neutral position. Low range improves light off-road performance and helps ease maneuvers, such as pulling a boat up a steep launch or backing up with a trailer. The neutral position in the transfer case allows the vehicle to be flat-towed without damaging powertrain components. Named one of Ward’s 10 Best Engines for three consecutive years, Durango’s standard 3.6-liter Pentastar V-6 engine generates an impressive 290 horsepower (295 horsepower on Rallye, Blacktop Package and Citadel) and 260 lb.-ft. of torque. The Pentastar V-6 engine allows Durango to tow a best-in-class 6,200 pounds. The 5.7-liter HEMI V-8 engine produces a best-in-class 360 horsepower and 390 lb.-ft. of torque with a best-in-class tow rating of 7,400 pounds. The 5.7-liter HEMI engine’s Fuel Saver Technology with cylinder-deactivation seamlessly alternates between smooth, high-fuel-economy four-cylinder mode, when less power is needed, and V-8 mode when more power is in demand. This optimizes fuel economy when V-8 power is not required, without sacrificing vehicle performance or capability. The 2016 Dodge Durango features a standard eight-speed automatic transmission with rotary shifter and steering wheel-mounted paddle shifters as standard equipment on all models. This state-of-the-art transmission improves fuel economy up to 15 percent compared with the five-speed automatic it replaced, along with enhanced performance and smoother shifts. All these attributes perfectly enhance Durango’s fun-to-drive nature. The 2016 Dodge Durango also features an Eco Mode that contributes to its improved fuel economy. Eco Mode optimizes the transmission’s shift schedule, as well as throttle sensitivity, and Fuel Saver Technology with cylinder deactivation in V-8 models, to maximize fuel economy. Dodge designers have brought Durango to the forefront of technology in the three-row SUV segment, while taking nothing away from the utility and build quality for which Durango is known. The instrument panel features a center stack that houses the 5-inch and 8.4-inch Uconnect touchscreens. Under these large, easy-to-use touchscreens are redundant button and knob controls for audio and climate functions. The bottom of the center stack houses a media hub with an SD card slot, USB outlet and auxiliary jacks, as well as a storage bin. 7-inch thin-film transistor (TFT) screen. Standard on all models, this screen allows for drivers to customize more than 100 ways how information is presented. Framing the instrument cluster is a three-spoke steering wheel with standard paddle shifters. The buttons to control TFT driver information functions are large and illuminated to make them easier to operate. Buttons for Uconnect and phone access reside along the bottom edge of the vertical spokes. Audio controls are found on the back of the upper steering wheel spokes. With standard seven-passenger seating and luxurious second-row captain’s chairs available on all models, the seats in the 2016 Dodge Durango can be converted to as many as 50 different configurations. Families with three or more children will find the Durango’s available captain’s chairs with pass through especially helpful as two car seats can stay latched into the second row seats, and there’s still easy pass-through for passengers to walk between to get to the third row. The second-row captain’s chairs will also make adults feel like they are riding in first-class, with comfortable bucket seats with individual armrests. A fold-flat front passenger seat is standard on models that aren’t equipped with the ventilated seat option. By folding forward, the passenger seat provides more utility, which lets customers load and carry long objects. Once flat, the seat back panel also serves as a convenient utility table. An active head restraint system adds to the long list of available safety and security features. A versatile 60/40 split folding second-row seat conveniently folds and tumbles. Transporting long items, like 10-foot 2x4s, is not a problem as the left side of the second row folds 60 percent, allowing the versatility of folding the 40 percent seat in tandem with the front passenger fold-flat seat. Longer items can be stowed even with passengers in the second row. To make passengers more comfortable, second-row seats also are available with heat, and they recline 18 degrees. The third-row seat features a 50/50 split and is easily folded from the rear of the vehicle. For even more utility, both the second- and third-row seats fold to provide a flat load floor to haul a 6-foot couch with room for a coffee table. Clever touches abound, including a switch in the instrument panel to remotely lower the third-row headrests when not in use. Five-inch and 8.4-inch touchscreens, a customizable 7-inch TFT gauge display, forward collision warning with crash mitigation, adaptive cruise control with stop, the latest generation of Uconnect Access Via Mobile and a dual-screen Blu-ray DVD system are just some of the 2016 Dodge Durango’s standard and available state-of-the-art features. The forward collision warning system with crash mitigation alerts the driver if they’re approaching a vehicle in front too quickly, and the adaptive cruise control with stop will keep Durango at a driver-selected distance from the vehicle in front when cruise control is engaged and can even bring the SUV to a controlled stop. Uconnect Access connects vehicle occupants directly with police, fire department or ambulance service dispatcher with the push of the “9-1-1” button on the Durango’s rearview mirror – no cell phone needed. The same logic works for roadside assistance. One push of the “ASSIST” button summons help directly from the FCA US roadside assistance provider or the Vehicle Customer Care Center. Further peace of mind comes from the available theft alarm notification, which alerts owners via SMS text message or e-mail whenever their Durango’s security alarm is activated. For the greatest convenience and flexibility, up to five people can be notified. Customers can put away their smartphones, keep their hands on the steering wheel and still interact with their devices in the ways to which they are accustomed. Media apps from Pandora to iHeart radio to Slacker are all available via voice command – a function of Uconnect’s powerful, Cloud-based voice recognition capability. Uconnect Access allows the driver to execute many of the normal functions, such as climate, audio, texting and Bluetooth, all by voice. Durango also has the ability to be used as a Wi-Fi hot spot. A Yelp search engine can be used via voice command if the driver needs to find a destination. Uconnect navigation then calculates a route and stores the destination’s telephone number for handsfree calling. Mounted on the back of the front seats is an available class-exclusive Blu-ray video rear entertainment system. This system features two high-resolution 9-inch screens, one on each front seat back. Each screen allows customers to watch their movies on Blu-ray or standard DVDs or play their high-definition media interface (HDMI) gaming systems via inputs for HDMI cables or RCAs for each screen integrated into the front seat backs. Wireless headphones are included as is a wireless remote. The 2016 Dodge Durango offers consumers more than 60 available safety and security features, including standard all-speed traction control and electronic stability control (ESC), which improve overall vehicle handling and performance both on- and off-road. Standard trailer-sway control enhances towing capabilities and keeps the vehicle and trailer aligned as the Durango travels down the road. Available safety and security features include forward collision warning with crash mitigation, adaptive cruise control with stop, Uconnect Access with 9-1-1 call and roadside assistance. Blind-spot Monitoring (BSM) and Rear Cross Path (RCP) detection, which aid drivers when changing lanes or in parking lot situations, are also available. In addition, standard front-row active head restraints, standard full-length three-row side-curtain air bags and standard front-seat-mounted side thorax air bags offer enhanced occupant protection to passengers in the event of a collision. In total, Durango offers seven standard airbags. All 2016 Dodge Durango SXT, Limited and Citadel models feature the award-winning Pentastar 3.6-liter V-6 engine with 290 horsepower and 260 lb.-ft. of torque as the standard engine (295 horsepower on Rallye and Blacktop Package models and Citadel). It’s mated to a class-exclusive standard eight-speed automatic transmission equipped with a class-exclusive rotary shifter and standard paddle shifters on the steering wheel and can tow up to 6,200 pounds. 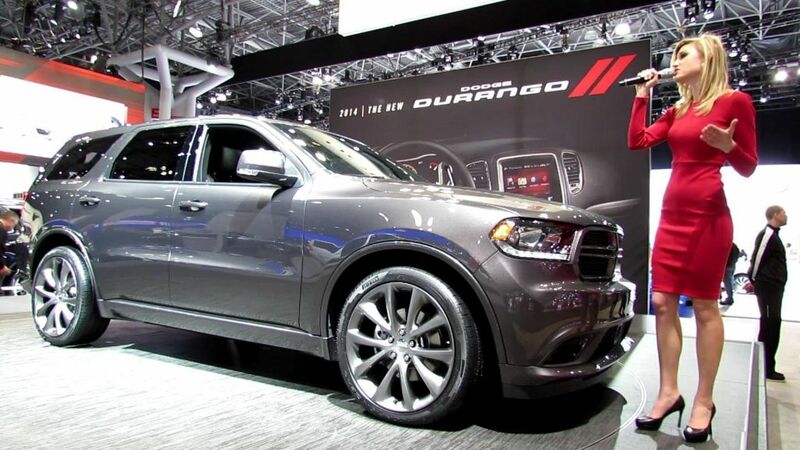 The 3.6-liter V-6 engine gives Durango class-leading driving range of more than 600 miles per tank. Every SXT features premium amenities inside and out, including bright accents on the exterior and premium soft-touch surfaces on the interior. Other standard features include class-exclusive signature 192 LED racetrack tail lamps, four-wheel disc anti-lock brakes, electronic stability program (ESP), trailer-sway control, automatic projector-beam headlights, projector fog lamps, deep-tint sunscreen glass, power body-color mirrors, speed-sensitive, variable intermittent wipers, chrome grille surround and split crosshairs with black “Split-Hex” texture and, new for 2016, 18-inch wheels with Satin Carbon finish. On the inside, the 2016 Dodge Durango SXT features standard three rows of seats with 60/40 split fold and tumble second row, 50/50 split, folding third row, premium cloth seats, fold-flat front passenger seat, Dodge three-spoke steering wheel with paddle shifters, 7-inch reconfigurable TFT gauge cluster, 5-inch Uconnect touchscreen with Uconnect AM/FM/MP3, six speakers, power windows, power door locks, power mirrors, remote keyless entry, cruise control, three 12-volt power outlets located in the instrument panel, the center console and the rear cargo compartment, tri-zone automatic temperature control, including infrared sensors and rear seat outlets, rear-seat air conditioning, air filtering, an overhead console with two LED map lamps, two courtesy lamps, sunglass storage, full-length floor console and a tilt/telescoping steering wheel with audio, speed, Driver Information Display (DID) and phone controls. Standard safety features include seven standard airbags, active front headrests and four-wheel disc anti-lock braking system. The Dodge Durango Limited delivers all the standard features of the SXT and for 2016 adds new 18-inch wheel finish with Granite Crystal pockets. Additional standard features include LED daytime running lamps, signal repeater mirrors, the 8.4-inch Uconnect touchscreen, Capri leather seating, leather-wrapped steering wheel, heated steering wheel, heated first- and second-row seats, 12-way power driver seat with memory and power four-way lumbar adjustment, 10-way power front passenger seat, including power four-way lumbar adjustment, remote start, ParkSense rear park assist, ParkView rear backup camera, vehicle security alarm, power folding auto-dimming mirrors with memory, HomeLink universal transceiver, 115-volt AC, 150-watt power outlet and Limited badge. The Citadel is the ultimate in Durango luxury. Citadel customers want premium content with a performance bias, and realize Citadel gets them there at an attainable price in a style that stands apart from the crowd. Building off the Durango Limited, Durango Citadel’s standard features include rich, perforated Nappa leather, heated and ventilated front seats and heated second-row seats available in Black, Black/Light Frost or Black/Tan. Other standard features include: the Uconnect Access 8.4-inch touchscreen with voice-command 3D navigation and live streaming internet radio, remote start, all-new for 2016 unique 20-inch fully polished aluminum wheels, power sunroof, automatic high-beam HID headlamps, rain-sensitive front wipers, power tilt-and-telescoping steering wheel, power liftgate, dual exhaust with 295 horsepower (V-6) and more. Taking the chrome-accented and upscale look of the Durango Citadel further for 2016 is an all-new monochromatic exterior appearance that includes lower front- and rear-fascia accents, lower sill and wheel flares painted to match this Dodge Durango model’s body color. The high-performance version of the 2016 Dodge Durango comes standard with body-color hot-rod looks, HEMI power, world-class handling and true R/T heritage. The 5.7-liter HEMI V-8 engine produces a best-in-class 360 horsepower and 390 lb.-ft. of torque with a best-in-class tow rating of 7,400 pounds. The R/T model features a unique sport-tuned suspension, 20-inch performance tires with 20-inch low gloss Granite Crystal aluminum wheels, a 20 mm lower ride height, a sporty monochromatic exterior appearance with black headlamp bezels, darkened headlamps, R/T-embroidered leather seating with contrast stitching, Beats premium audio system, power liftgate and HID low-beam headlamps. Now standard for 2016 on the R/T model are front ventilated Nappa leather seats with the choice of Radar Red or black Nappa leather, perforated and heated steering wheel, power tilt/telescoping steering wheel, power eight-way passenger seats, rain-sensitive windshield wipers, premium 8.4-inch Uconnect touchscreen with 3D voice-activated navigation, cargo net and cargo compartment cover.